This is not a story of bad things happening to bad girls. I say this because I know you, Dex, and I know how you think. I'm going to tell you a story, and this time, it will be the truth. Hannah Dexter is a nobody, ridiculed at school by golden girl Nikki Drummond and bored at home. But in their junior year of high school, Nikki's boyfriend walks into the woods and shoots himself. In the wake of the suicide, Hannah finds herself befriending new girl Lacey and soon the pair are inseparable, bonded by their shared hatred of Nikki. Lacey transforms good girl Hannah into Dex, a Doc Marten and Kurt Cobain fan, who is up for any challenge Lacey throws at her. The two girls bring their combined wills to bear on the community in which they live; unconcerned by the mounting discomfort that their lust for chaos and rebellion causes the inhabitants of their parochial small town, they think they are invulnerable. 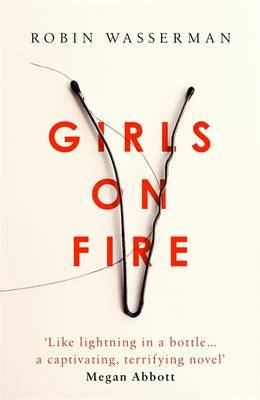 But Lacey has a secret, about life before her better half, and it's a secret that will change everything ...Starting - and ending - with tragedy, Girls on Fire stands alongside The Virgin Suicides in its brilliant portrayal of female adolescence, but with a power and assurance all its own. Fantastically 90s. Really puts you back there. Or just there I guess, if you're a kiddie. Reminiscent of Megan Abbott. Maybe not quite as good as Abbott, but still very, very good.